Jati Adiputra (PhD with Dr. Naidu Rayapati): Senior Quarantine Officer, Center for Diagnostic Standard of Agricultural Quarantine. Indonesia Agricultural Quarantine Agency. Christian Aguilar (MS with Dr. Tobin Peever; PhD with Dr. Mark Mazzola): Postdoc at Virginia Tech University; the Tidewater Ag Research and Extension Center. Segun Akinbade (MS with Dr. Ken Eastwell): WA State Department of Agriculture, Prosser, WA. Ana Vida Alcala (PhD with Dr. Lindsey du Toit): Research Scientist, Valent USA, Minneapolis, MN. Christie Almeyda (PhD with Dr. Hanu Pappu), Director, Micropropagation & Repository Unit, North Carolina State University, Raleigh, NC. Maryam Almoran (MS with Dr. Frank Dugan): PhD student, University of Idaho, Moscow, ID. Zahi Atallah (PhD with Dr. Dennis Johnson): Dean of Advanced Technology, Hartnell College, Alisal, CA. Renuka Attanayake (PhD with Dr. Weidong Chen): Faculty member, Department of Botany, University of Kelaniya, Sri Lanka. Ebrahiem Babiker (PhD with Dr. Scot Hulbert): Research geneticist with USDA-ARS in Poplarville, MS.
Sudeep Bag (PhD with Dr. Hanu Pappu): Assistant Professor, University of Georgia, Tifton, GA.
Xiaodong Bao (PhD with Dr. Lori Carris); Chinese Academy of Tropical Agriculture Science, Hainan, China. Austin Bates (MS with Dr. Brenda Schroeder): Research staff, Entomology, Plant Pathology and Nematology, University of Idaho. Abby Beissinger (MS with Dr. Debra Inglis) Visiting Assistant Extension Educator of the Natural Resources Conservation Academy, University of Connecticut. Tyler Bourret (MS with Dr. Dean Glawe): Completed PhD at UC Davis; Research Associate, Washington State University, Puyallup, WA. Peng Cheng (PhD with Dr. Xianming Chen): Plant Pathologist, China Seed International. Noma Chingandu (MS with Dr. Hanu Pappu): PhD student, University of Arizona. Jamie Cummings (MS with Dr. Lindsey du Toit): Research Technician, Cornell University, Department of Plant Pathology. Norm Dart (MS with Dr. Gary Chastagner): Plant Pathologist, Virginia Department of Agriculture and Consumer Services. Phuong Dinh (PhD with Drs. Axel Elling and Debra Inglis): Plant Pathologist, Southern Horticultural Research Institute, Vietnam. Bhanu priya Donda (PhD with Dr. Naidu Rayapati): Plant Pathologist/VIrologist, Sunburst Plant Disease Clinic, Inc., Turlock, CA. Jeremiah Dung (PhD with Dr. Dennis Johnson): Assistant Professor, Oregon State University, Madras, OR. Sahar Eid (PhD with Dr. Hanu Pappu): Associate Lecturer, Box Hill Institute of Higher Education, Box Hill, Vic, Australia. Juliane Evans (MS with Dr. Tim Murray): DVM, Lebanon, Pennsylvania. Leonardo (Leo) De La Fuente (PhD with Dr. Dave Weller): Associate Professor, Auburn University. Andrea Garfinkel (PhD with Dr. Gary Chastagner) – Postdoc, Oregon State University. Emily Gatch (PhD with Dr. Lindsey du Toit): Instructor for the Sustainable Agriculture program at Edmonds Community College, Edmonds, WA. Jessica Gigot (MS with Dr. Debbie Inglis): PhD in Horticulture and an MFA in creative writing. She is a member of the Science Faculty at the Northwest Indian College, Bellingham, WA. She is a recently published poet. Chris Hammond (MS with Dr Dennis Johnson): Field Representative in the Yakama Valley. Leigh Ann Harrison (MS with Dr. Tim Murray): Monsanto Company, Chesterfield, MO. 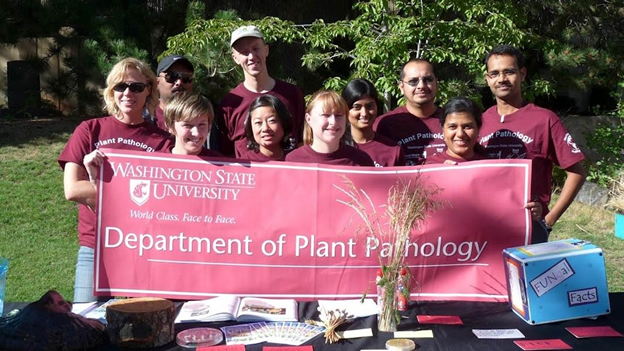 Sierra Hartney (MS with Dr. Lee Hadwiger): Plant Pathologist, Alf Christianson Co., Mount Vernon, WA. Donna Henderson (PhD with Dr. Katerina Riga); Staff Scientist, Monsanto, Woodland, CA. Marco Hernandez-Bello (MS with Dr. Tobin Peever): Post-doctoral fellow, USDA-ARS, Prosser, WA. Pablo Hernandez-Perez (MS with Dr. Lindsey du Toit): Entomology assistant, USDA ARS, Yakima, WA. Shashika Hewavitharana (MS and PhD with Dr. Mark Mazzola) Assistant Professor, Plant Pathology, Horticulture and Crop Science Department at California Polytechnic University-San Luis Obispo. Leslie Holland (MS with Drs. Dean Glawe and Gary Grove) PhD Student, University of California, Davis. Danny Humphreys-Pereira (PhD with Drs. Axel Elling and Tobin Peever): Assistant Professor, University of Costa Rica. Jason Ingram (MS with Dr. Dennis Johnson), Research Assistant with Cornell,NY. Sridhar Jarugula (PhD with Dr. Naidu Rayapati): Agr Consultant, Administrative Staff College of India, Hyderabad, India. Madhu Kappagantu (PhD with Drs. Hanu Pappu and Ken Eastwell) Post Doctoral Research Associate , Department of Plant Science and Landscape Architecture,University of Maryland with Dr. Culver. Shyam Lal Kandel (MS with Dr. Tim Paulitz): postdoc with UC Davis in Salinas, CA. Wonyong Kim (PhD with Dr. Weidong Chen) Postdoctoral Associate, Michigan State University. Elizabeth Kramer (MS with Dr. Dean Glawe): Lead Biologist, NorthStar Technologies. Youn-Sig Kwak (PhD with Dr. Dave Weller): Professor, Gyeongsang National University, South Korea. Anna Leon (PhD with Dr. Gary Chastagner): Forest Pathologist, Weyerhaeuser NR. Yu-Hsuan Lin (PhD with Dr. Hanu Pappu): Postdoctoral fellow, USDA ARS and Cornell University. Qingchun Liu (Ph.D. with Dr. Chang-Lin Xiao), Postdoctoral fellow, WSU IAREC, Prosser. Chan Maketon (MS with Dr. Pat Okubara): AppliedChem and PhD student, Kasetsart University, Bangkok, Thailand. Stacy Mauzey (MS with Dr. Tim Murray): Diagnostician, TriCal Inc., Gilroy, CA. Olga Mavrodi (PhD with Dr. Linda Thomashow), Research Associate, University of Southern Mississippi, Hattiesburg, MS.
Sean McCotter (MS with Dr. Lori Carris): PhD Student, Department of Microbiology and Immunology, University of British Columbia. Katie McKeever (MS and PhD with Dr. Gary Chastagner): USDA Plant Pathologist, Resistance Screening Center Manager, Forest Service, Southern Region, Forest Health Protection, Asheville, NC. Kamil Mohd Jaaffar (PhD with Dr. Linda Thomashow): Staff Scientist, Malaysian Cacao Board, Malaysia. Jon Minch (MS with Dr. Tim Murray): Faculty Research Assistant, Hatfield Marine Science Center, Oregon State University. Raul Allende-Molar (PhD with Dr. Dave Weller): Research Associate, Center for Food and Development, Sinaloa, Mexico. Khalid Naveed (PhD with Dr. Hanu Pappu): Assistant Professor, University of Agriculture, Faisalabad, Pakistan. Taras Nazarov (PhD with Dr. Deven See): post doc with Andrei Smertenko, Institute of Biological Chemistry, WSU. Evans Njambere (PhD with Dr. Weidong Chen): Program Manager, Pioneer-Dupont, Johnston, IA. Jennifer Niem (M.S with Dr. Debbie Inglis) Prof Service Staff, Crop & Env Services Division, IRRI, Los Baños 4031, Philippines. Nadav Nitzan (PhD with Dr. Dennis Johnson), Scientist for Stepac in Israel. Sudarsana Poojari (PhD with Dr. Naidu Rayapati): Agriculture and Agri-Food Canada, Pacific Agri-Food Research Centre, British Columbia, Canada. Grant Poole (PhD with Dr. Tim Paulitz): Plant Pathologist, Bayer-Monsanto. Lyndon Porter (PhD with Dr. Dennis Johnson), Research Plant Pathologist, USAD-ARS, Prosser. Marianne Powell (MS with Dr. Debbie Inglis): Plant Pathologist, CSP Labs, Sacramento, CA. Megan Robinson (M.S. with Dr. Tim Murray), Bayer Crop Sciences, Saskatoon, Canada. Lucy Rollins (M.S. with Dr. Gary Chastagner): Carlisle Interconnect Technologies in Kent, WA. Amy Salamone (MS with Dr. Debbie Inglis) Forest Pathology Laboratory Technician at Weyerhaeuser, Centralia, WA. Kurtis Schroeder (PhD with Dr. Tim Paulitz), Assistant Professor, University of Idaho, Moscow, ID. Amogelang Segwagwe (PhD with Dr. Ken Eastwell): Lecturer, Botswana Agricultural College, Botswana. Parama Sikdar (PhD with Mark Mazzola): Post Harvest Physiologist with Decco U.S., East Wenatchee, WA. Dipak Sharma Poudyal (PhD with Dr. Xianming Chen): Plant Pathologist, Oregon Department of Agriculture, Salem, OR. Raina Spence (MS with Dr. Debbie Inglis): Director of Outreach, WA State Potato Commission. Jane Stewart (PhD with Dr. Tobin Peever): Assistant Professor, Colorado State University. 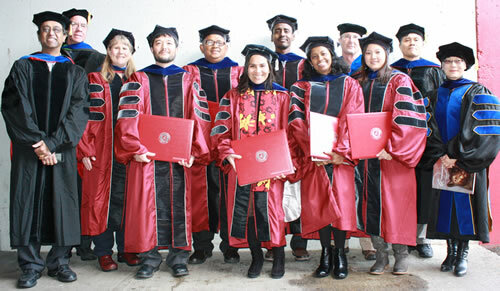 Jinita Sthapti (PhD with Dr. Deven See): Post doc with the USDA-ARS in Salinas CA. Afsha Tabassum (PhD with Dr. Hanu Pappu). Post-doctoral Fellow, University of Georgia, Tifton, GA.
Lydia Tymon (PhD with Dr. Dennis Johnson): Postdoctoral Research Associate, WSU Mount Vernon NWREC. Leila Vasquez-Siller (Ph.D. with Dr. Tim Murray): Professor, Universidad Autónoma Agraria Antonio Narro. Saltillo, Coahuila,México. Danilo Vera Coello (PhD with Dr. Tim Murray): Head of Plant Protection Department, National Institute of Agricultural Research (INIAP), Ecuador. Dan Villamor (PhD with Dr. Ken Eastwell): Program Associate, Department of Plant Pathology, University of Arkansas with Dr. Ioannis Tzanetakis. John Weber (MS with Dr. Lindsey du Toit): Agronomist with Central Oregon Seeds, Inc., Madras, OR. Muditha Weerakoon (MS with Dr. Mark Mazzola): Los Angeles, CA. David Wheeler (MS and PhD with Dr. Dennis Johnson): Assistant Professor, Plant Science and Plant Pathology, Montana State University. Michele Wiseman (MS and with Dr. Gary Grove): Faculty Research Assistant in Botany & Plant Pathology at Oregon State University. Chongjing Xia (PhD with Xianming Chen), Associate Professor, Southwest Science and Technology University, Mianyang, Sichuan, China. Guiping Yan (PhD with Dr. Xianming Chen): Assistant Professor, North Dakota State University, Department of Plant Pathology, Fargo, ND. Ying Zhai (PhD with Dr. Hanu Pappu): Postdoctoral Research Associate, WSU.